There is no dress code! Wear comfortable shoes and bring water. Reserve your place by writing to roseadoherty@aol.com. Gibbs was the most famous school of its kind in the world from 1911 to 2011. Katharine Gibbs School made sure that all of the campuses from Providence, Boston, New York, and beyond were in beautiful buildings in elegant parts of their cities. What could be more elegant than Back Bay? Although free, attendance is limited to not more than twelve people. The tour is led by Rose A. Doherty, author of Katharine Gibbs: Beyond White Gloves, the first book about the history of Gibbs and its amazing entrepreneurial founder. Rose Doherty is former academic dean at Gibbs and former chair of the Gibbs College Boston Board of Trustees. Please call (781) 449-3175 to ask questions or let me know you will be present or write to roseadoherty@aol.com. We will meet at the right-hand statue in front of the Boston Public Library, Dartmouth Street, Copley Square. 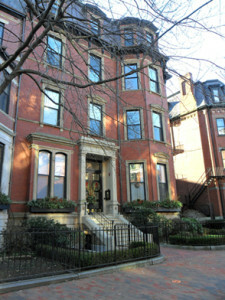 Join me in a tour of the excellent sites of Gibbs in Back Bay from 1917 to 2011. Whether you are a graduate, a history buff, or someone who has heard about Gibbs for years and wants to know more, here is a great treat! STAY TUNED FOR MORE UPCOMING TALKS. COMPLETED TALKS ABOUT GIBBS ARE BELOW. The College Club of Boston, the oldest women’s college club in the country, served as a dormitory for some Gibbs students. Two and one-half month exhibit of Gibbs memorabilia and related philatelic material. 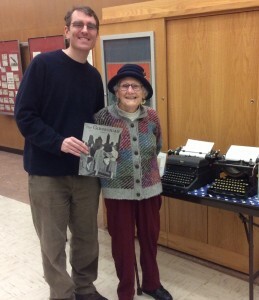 Jean Bates Pratt, 1939 graduate, with a 1939 Gibbsonian from the exhibit. 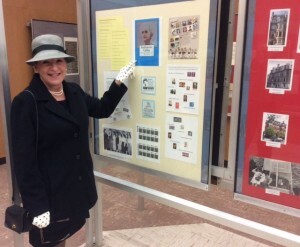 Graduates wore hats and gloves to the exhibit. Canton Public Library, Canton chapter of the American Association of University Women.